Who doesn’t want a head full of thick, shiny hair? In women, it’s a sign of beauty and radiant health, and in men it’s often considered a reflection of their masculinity – men who start to go bald often feel that their manliness is somehow threatened. Browsing the “hair care” aisle in CVS shows what modern beauty standards recommend for any kind of hair problem: endless pots, bottles, and spray cans of soaps, shampoos, conditioners, detanglers, relaxers, and styling products. But for truly healthy hair, it might be time to spend less time focusing on what you rub on your head, and more time on what you put in your mouth. Look around any long-term hospital facility and you’ll see plenty of thin, brittle hair with no shine or bounce. This kind of hair thinning is a sign of extreme mental stress or physical malnourishment, and it’s not restricted to long-term inpatients. Anorexic patients see their hair become frail and brittle and fall out in huge chunks. Crash dieters are plagued by hair loss, because the cycle of binging and restricting doesn’t leave much room for proper nutrition. Thinning hair is a common aftereffect of a traumatic life event, like a death in the family or a chronic illness. This is also why so many vegans experience hair loss and brittle, dull hair – they aren’t getting enough nourishment without nutrient-dense animal products in their diet. The scientific term for this is telogen effluvium: essentially, extreme stress disrupts the normal cycle of the hair follicles, causing them to grow more slowly and spend more time resting between growing hairs. Although it can be psychologically devastating, this type of hair loss is clearly beneficial from an evolutionary perspective. 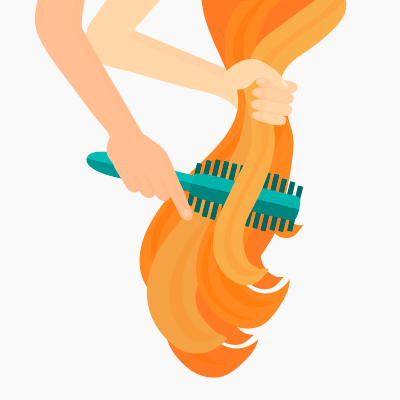 If your body doesn’t have enough energy to go around, hair is pretty far down on the list of priorities, and it’s better to be losing hair than losing teeth or muscle. In this situation, the important thing to remember is that there’s nothing wrong with the hair itself. Thin and brittle hair is just an outward sign that the body is under too much stress, mental or physical. The solution is to tackle the stress, not just focus on the hair. Fortunately, that makes it relatively easy to treat. Eat plenty of nutrient-dense foods like eggs, organ meats, and all kinds of vegetables, with some starches to send your body a clear signal that you’re getting plenty of nutrition and can afford to “spend” some of it on your head. Iron and protein are particularly important, but it shouldn’t be necessary to take supplements for these on Paleo, since red meat is rich in both. Biotin supplements can sometimes help, but these should be an addition to a nourishing diet, not a replacement for it. Get plenty of rest, and practice as much stress management as you can. The good news is that telogen effluvium is usually reversible, so the hair will grow back once the stressor or the malnutrition is gone. In patients with telogen effluvium, the hair becomes brittle and lifeless, but rarely disappears altogether. But some people also suffer from balding over part or all of their head, and this isn’t necessarily caused only by stress. Hair loss (alopecia) is often caused by hormonal problems. One of the most common types, androgenetic alopecia, is also called male-pattern baldness, but it can occur in women as well. People with this condition see their hair thin and eventually disappear altogether, without any apparent connection to physical stress or emotional trauma. As the name implies, androgenetic alopecia is hair loss driven by hormones (“androgen” is just a generic name for all male hormones). Specifically, it’s caused by an oversupply of Dihydrotestosterone (DHT), which is a derivative of testosterone. Too much DHT in the hair follicles changes the shape of the follicles. This causes the hair to grow more slowly, and what that does grow is shorter and thinner. In some people, androgenetic alopecia is inherited, but it’s also associated with hormone disorders. Women with Polycystic Ovary Syndrome, a hormonal disorder that involves abnormally high levels of androgens, frequently have thinning hair. It’s a common symptom of both hyperthyroid and hypothyroid disorders (the thyroid controls hormone levels throughout the body). Diabetes and metabolic syndrome are often associated with androgenetic alopecia, because insulin resistance can have serious effects on the body’s hormonal systems. As well as these more serious conditions, it’s also more common in women who are pregnant or using birth control pills. Genetic predisposition to hair loss is impossible to erase, but all the other associated hormonal disorders respond well to Paleo, since a Paleo diet improves insulin sensitivity and eliminates phytoestrogens like soy. Gluten is also a huge trigger of thyroid problems, so just eliminating wheat and gluten grains can help treat hormone dysregulation. Basically, the ideal diet for treating hormone-related hair loss is a nourishing, nutrient-dense mix of plant and animal foods without any damaging toxins – in other words, Paleo. As a bonus, eliminating environmental toxins in the form of plastic food containers and cleaning chemicals can complement the diet in restoring natural and healthy hormone function. As well as hormonal disorders, autoimmunity can also be behind balding. Alopecia areata is an autoimmune disease that can cause hair loss, either as randomly placed bald spots (alopecia areata), hair loss from the entire scalp (alopecia areata totalis), or hair loss across the entire body, including eyebrows and eyelashes (alopecia areata universalis). Alopecia areata is impossible to confuse with androgenetic alopecia: it creates very distinctive patchy hair loss, rather than an overall thinning. In the case of any autoimmune disorder, the first-line dietary therapy should be healing a leaky gut. Cutting out grains, legumes, and seed oils is enough for some people, but it might be necessary to spend some time on the autoimmune protocol, a stricter version of Paleo designed specifically for autoimmune disorders. Autoimmune Paleo excludes eggs, nuts, and vegetables in the nightshade family, which can cause autoimmune flare-ups. No, it isn’t a link between constipation and hair loss. No-poo is actually short for “no shampoo,” and it refers to a hair care regimen that uses all-natural hair products to avoid the chemicals found in modern shampoos and conditioners. Some people with sensitive skin react poorly to many ingredients even in hypoallergenic or children’s shampoos. These products strip the natural oils out of the hair, and the follicles in the scalp try to compensate by making even more, in a vicious cycle of increasingly greasy hair. No-poo doesn’t mean you never clean your hair; it just means that you don’t use shampoo to do it. For a cleanser, baking soda is both cheaper and gentler than any kind of shampoo. Just mix 1 tablespoon of baking soda with a cup of water, and use it like a regular shampoo. To condition the hair afterwards, use anything acidic – lemon juice and apple cider vinegar are both popular choices. Mix in the same proportions as the baking soda (1 tablespoon to 1 cup of water) and rinse. This method isn’t a magical cure for hair loss from any cause. But it is a way to reduce the chemicals in your life, be gentler to your scalp and your head, and keep your hair looking the best it can. Drugstore beauty aisles are full of products claiming to cure all kinds of “problem hair.” But just changing what you put on your head won’t fix hair problems that are really just symptoms of a toxic or malnourishing diet. A better solution might be to replace the parade of chemical gloop with some real food and a few boxes from the grocery section, and then lie down for a nap!